Check out our newest video workshop, Enfield Cupboard with Hand Tools featuring Chris Gochnour and be sure to help us make our video workshops even better by filling out this quick survey. Question 1: From Dean: I have an enjoyable dilemma. I am building a garage with adjacent shop space at our north home. The shop is 200 sq-ft, one third the size of my St. Paul shop, and thus creates a challenge adapting to a small space. I have been devouring all the FWW articles on small shops and believe I can make this space workable but I will have to make some concessions, mainly my tablesaw, jointer, and planer. Will I be satisfied and served by a portable, contractor-style table saw and a combination jointer-planer? Portable Tablesaws by Patrick McCombe #209–Tools & Shops 2010 Issue Question 2: From Tanc: Is there a guideline for when stretchers are needed to strengthen a piece? I am looking to build an entryway table from oak that is 32-in. high, 60-in. long, 12-in. deep, with a 2 ½-in. apron and 2-in. legs that taper down to 1-in. I prefer simple designs, and would rather not have stretchers. Floating-Top Table by Michael Pekovich #263-Sep/Oct 2017 Issue Engineer Shelves With The Sagulator by Bill Kovalick #190–Mar/April 2007 Issue Brass Stretcher Brightens a Bench by Michael Robbins #267–Mar/Apr 2018 Issue Given a common inspiration, three furniture makers create a diversity of designs by Mark Schofield #184–May/June 2006 Issue Ben's mockup of Tanc's table with the given dimensions: Benside Table: Segment: Smooth Moves John: Not cleaning the lint off of a new floor finish applicator Anissa: Touching a friends piece of furniture while the finish was still wet Ben: Trusting a tool that should never have been trusted Question 3: When I set up my workshop, I positioned the bench facing a south-facing window and installed fluorescents directly above the bench at about eight feet above the floor. If I have a board on edge, any markings on the side facing my body are difficult to see because that area is in shadow. I want to avoid using task lights wherever possible, as they just get in the way. I'm thinking that more overhead lighting is the answer. Do you have any thoughts about where this should be positioned to minimize shadow areas when working at the bench? Let There Be Light by Nancy McCoy #209–Tools & Shops 2010 Issue Question 4: From David: I am baffled that some ash stock I milled a couple months ago is now nearly impossible to plane. I cut and milled the ash for a small box a while ago. It was wonderful to work with and easy to plane. I put the pieces aside to enjoy the far too short Minnesota summer. I kept it in the same place all my wood stock lives; my basement workshop. I was looking forward to getting back to work on the box. I decided to plane all the pieces again, assuming it wouldn’t be flat and square as it was months ago. I was dumbfounded that it was nearly impossible to plane. I used the exact same plane I used originally. I ended up resharpening the blade twice and adjusted it to take the finest possible shaving. Still it would stick and chatter across the board and leave tear out in the middle of smooth grain. To make sure I wasn’t hallucinating, I tried planing some oak and some twisty walnut. It performed beautifully. It was as though it had developed a skin of steel in the time since I first milled it. Any ideas about what/why this happened? Recommendations: Ben - PBS’s Craft in America episode–Visionaries Anissa - American violin maker–James Reynold Carlisle Every two weeks, a team of Fine Woodworking staffers answers questions from readers on Shop Talk Live, Fine Woodworking‘s biweekly podcast. 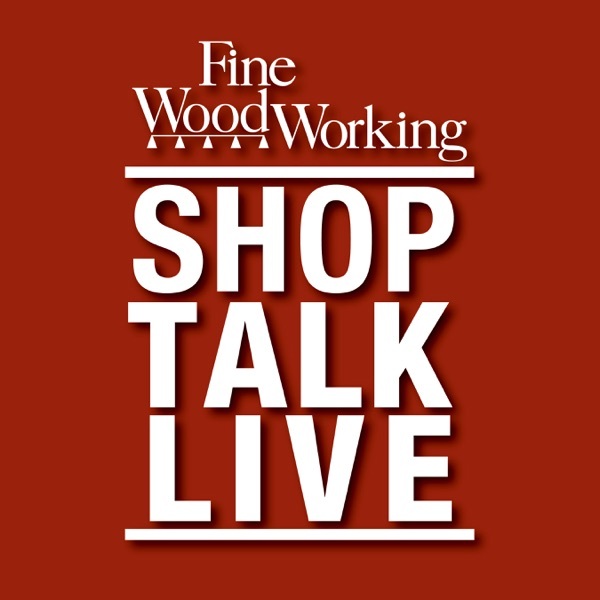 Send your woodworking questions to shoptalk@taunton.com for consideration in the regular broadcast! Our continued existence relies upon listener support. So if you enjoy the show, be sure to leave us a five-star rating and maybe even a nice comment on our iTunes page.